It may come as no surprise that Italy produces a LOT of wine. More wine than any other country, in fact. France is famous for its wine history and influence, and Spain holds its own as far as volume (and quality) go, but no country produces more (and exports more) than Italy. Given that, it may also seem unremarkable that America imports more wine from Italy than from any other country. The USA and Italy have a special relationship when it comes to wine. And why not? Italy is the land of Chianti, Barolo, Barbaresco, and so many other tremendous wines. Plus, Italian wines are food wines (and who doesn’t like to eat–especially Italian food?). 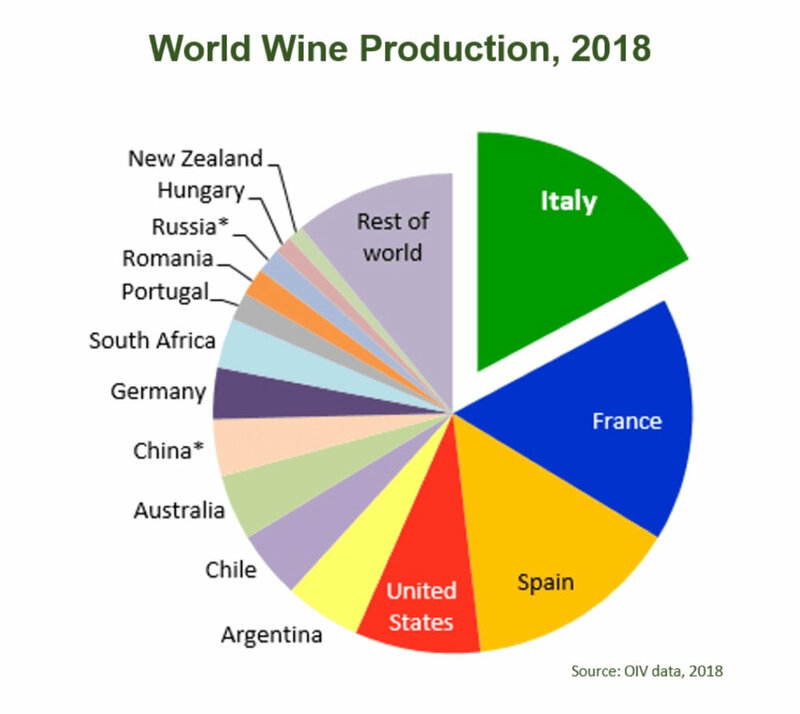 France and Spain are close behind Italy for top wine producing honors (with credit and thanks to italianwinecentral.com and the International Organization of Vine and Wine for the data and chart). Sorry France, Italy is America’s WFF (i.e., Wine Friend Forever). Italy’s #1 international wine market? USA! USA! So where the surprise in this story? This is, after all, the Wine Surprise blog. The surprise is this: All those famous Italian wines referenced above (not to mention prestigious and pricey Super Tuscans) finish behind the humble (and sometimes maligned) Pinot Grigio. 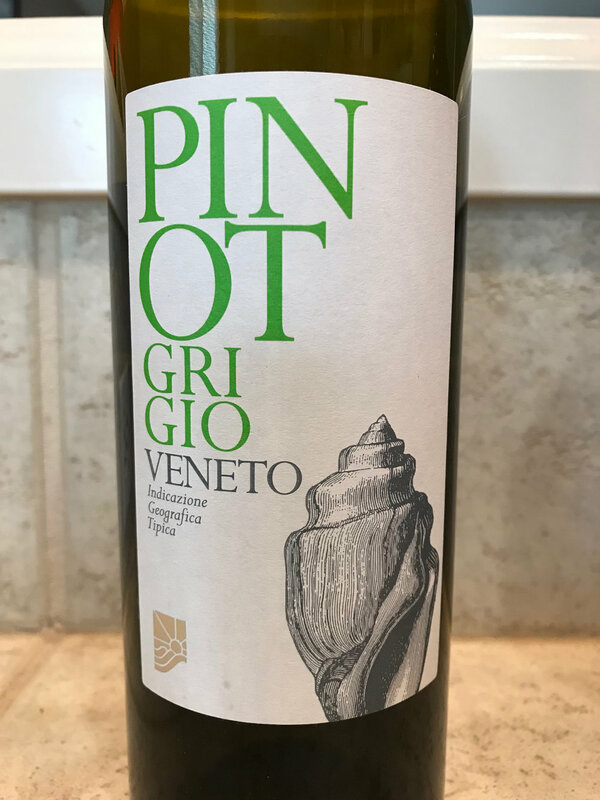 In fact, Pinot Grigio doesn’t only beat out other Italian wines for the top import honors in the US, it actually beats out all other wines from anywhere in the world. That’s right, Pinot Grigio is America’s favorite wine import. As a result, there’s been a tremendous increase of Pinot Grigio production in Italy. Here’s another view of the recent growth of Pinot Grigio (labeled Pinot Gris here) production in Italy. Pinot Grigio varies significantly in style and quality, so let’s take a closer look at the top producing regions for this popular grape. 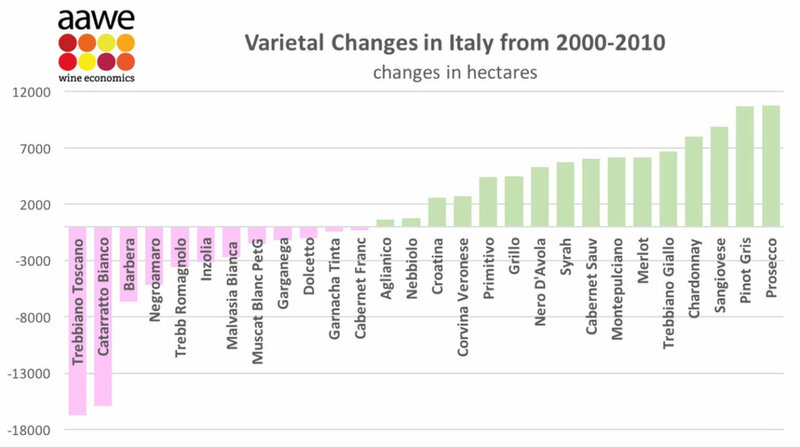 In the northeast of the country, Veneto, Alto Adige, Trentino, and Friuli-Venezia all produce dry Pinot Grigio wines but the choice of clones planted (not all Pinot Grigio vines are created equal), typical growing temperatures, and winemaking choices have a significant impact on the style (and quality) of the wines produced. Here’s the lineup. Let the tasting begin. The large Veneto region features flat, warm, and fertile vineyards that produce considerable yields from a Pinot Grigio clone that is known for its large berries (i.e., juicy!). These are simple wines made in a quick, straightforward manner. Did we mentioned that Veneto produces quite a bit of wine? Alto Adige, the farthest north of all Italian wine grape growing regions, has a cool climate which produces grapes high in acidity. Sloped vineyards face south-east and south-west to ensure that sufficient heat and sunlight are available during the growing season. Careful viticulture and lower yields tend to produce higher quality wines. These wines are light- or medium-bodied with delicate citrus notes. Extended skin contact, when employed, produces wines with more color, body, and complexity. Trentino, just south of Alto Adige, tends to be a bit warmer than its neighbor. Dry growing seasons are the norm (similar to Alto Adige) and grapes are grown on slopes as well as on the valley floor below. Those grown at the lower altitudes produce medium-bodied wines with lower acidity due to the extra ripening from warmer temperatures. Friuli-Venezia Giulia encompases the farthest northeast corner of Italy and includes cool vineyard sites that stretch into the foothills of the Alps as well as warmer vineyards closer to the Adriatic Sea. Within Friuli-Venezia Giulia, the hilly areas of Collio and Colli Orientali are known for concentrated expressions of Pinot Grigio. High-quality clonal selection, careful vineyard management, lower harvest yields, and winemaking techniques such as extended skin contact all contribute to the quality of these wines. To test out the prevailing views of Pinot Grigio from the regions above, I organized my own tasting of wines from four different regions. Like most experiments, it was flawed. The most significant example being that I was not able to find wines from different regions but of the same vintage. Otherwise, it was an instructive tasting experience. All four wines were removed from the refrigerator at 52F, which I think is an appropriate drinking temperature for this style of white wine. All were clean on the nose and showed no evidence of apparent flaws. With the exception of the wine from Trentino, prices increased along with regional reputation. Since that particular wine was the oldest tasted and Pinot Grigio is generally not a wine known to age well, I believe this anomaly may be a result of a price reduction from the retailer or distributor. Otherwise, the style and perceived quality of each wine did reflect the stature of its region of origin. Most importantly, I thought all four wines were delicious with a clear time and place for enjoying each. While some dismiss Pinot Grigio wines as cheap and boring, it cannot be ignored that there’s a long history of craft and care in making wines from this grape in the northeast of Italy. Anyone who avoids them wholesale is missing out. Have a favorite Pinot Grigio or another imported wine? Be sure to email us and tell us all about it.